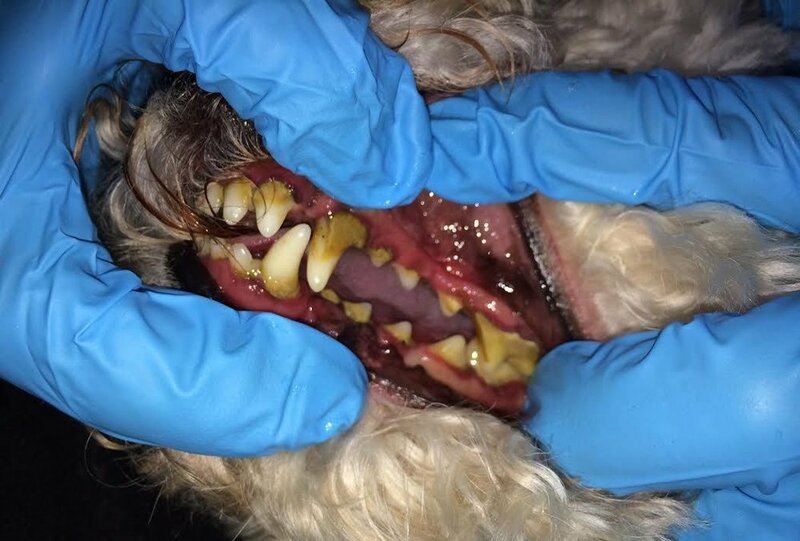 We at K-9 Smiles believe that removing plaque and tartar before it can cause periodontal disease goes a long way toward better dental heath for your pet. Your pet’s medical history is reviewed. Your pet will be assessed to see whether or not they will be a good candidate for this procedure. If they are not a right fit for this procedure the vet will explain why? We first give your pet Bach Flower essences to reduce stress. We then gently lay your pet on their back or side whichever position is comfortable for them on a dog bed. Small dogs and cats are wrapped in a towel to prevent them from struggling and hurting themselves. Your pet’s stress levels are monitored throughout the dental by a licensed veterinarian, and if we feel your pet’s stress levels are too high we will stop the dental. Before the dental cleaning process starts the oral cavity is rinsed with 0.12% Chlorhexadine to decrease the number of bacteria in the mouth. We use a sharp sterile scaler removing all the calculus from every tooth. That includes the buccal or labial, lingual interproximal and occlusal surfaces of each tooth. Curettes are used to remove plaque and calculus from below the gum line or subgingivally. After all the tartar has been removed each tooth is probed for pocket depth to identify gum disease. All of the identifiable disease present before treatment is recorded. This includes (but is not limited to) missing, loose, fractured, and discolored teeth, as well as feline oral resorbtive lesions, periodontal pocket depths, gingival recession and overgrowth (hyperplasia) and loose teeth. If necessary we will refer you to your vet. No matter how careful we are during the scaling/curettage phase of the teeth cleaning, minor micro abrasions of the tooth surface occur. Polishing smooths out the defects and removes any plaque missed during previous steps. We use a polisher, but for those dogs who will not tolerate the polisher, we hand polish. After polishing the teeth we rinse the mouth out with oral rinse solution. When the dog or cat is returned back to the owner an overview of the dental is given by the veterinarian explaining all that was identified in the mouth during the dental. If there are issues that need further attention the veterinarian will discuss a treatment plan. That may include dispensing antibiotics, following up with your veterinarian for a digital x-ray, tooth extraction or other procedure, and when you should return for the next cleaning. Every effort will be made to remove the tartar from your pet’s teeth. However, they are awake and it maybe impossible to remove all the tartar. Please understand that a non-anesthetic dental exam ($60.00) and cleaning ($195.00-$215.00) may not be as thorough as an anesthetic dental exam, cleaning and x-rays, but rather is just one part of a complete dental care plan for your pet. We are not cheap or inexpensive but we are AFFORDABLE. CALL NOW! 303-654-0560 or Check our CALENDAR for information on up-coming clinics near you! How do you do cats? The procedure in doing a dental for a cat is almost the same as a dog. However, instead of wrapping a cat in a towel, we wrap them in a cat bag. This is to insure their safety and ours. Usually this procedure will only take 30 minutes and like dogs, we discourage owners from being in the room.If we immediately find problems which need your veterinarian’s attention, Example: teeth which need to be extracted, we will refer you back to your Vet to have a dental under anesthesia . During the dental if we find any additional problems, we will put the information on your report card so you can discuss any further action with your own veterinarian. Do you use sterile tools? Yes, we sterilize all our tools, and we use a different clean scaler on every animal. There are circumstances where we might not be able to remove all the tartar. We do not pull teeth and we do not take X-Rays, so we can never see what is going on under the gum line. Remember an X-Ray will show if there is infection of the roots or the area around the root. If gum disease is present we will recommend an X-ray. If the enamel of a tooth is compromised we will recommend an X-ray. We believe small dogs should get yearly X-rays, because their teeth are so crowded it is very likely they have diseased roots. For larger dogs, if no gum disease is present then plan on an X-ray every 3-5 yrs. If gum disease is present then we recommend yearly X-rays. Can our technicians perform a cleaning on every dog? No, while we can clean the vast majority of dogs and cats there are some for whom it is not appropriate. Examples would be pets with severe gingivitis, caries, fractured teeth, abscesses, stomatitis, tumors etc. Whenever our technicians discover loose or fractured teeth, tumors, gum disease, or any other condition that needs your veterinarian’s intervention, they will write the information down for you so you can bring it to your veterinarian’s attention. Can you use this method on older pets? Yes, non-anesthetic dentals can be done on older pets and pets with chronic kidney, liver or heart disease who might not be a good candidate for a dental under anesthesia. Apply tincture of Organic Grape Seed, Myrrh, Aloe, or tea tree oil on the gums. Studies show low carbohydrate diets also lead to less plaque and calcium build up. How can I relieve my pet’s inflamed gums? Dilute salt water, baking soda and water. Mix into a paste and use. You can also use coconut oil. How can I make my own tooth paste for my pet?